Editor’s note: Countless Gambian journalists, activists and opposition members fled threats and intimidation during former-president Yahya Jammeh's two decades in power. Now, as Jammeh begins his life in exile, some of them are going home. VOA traveled from Dakar to Banjul with one of them. The last time Sheriff Bojang Jr. came home, 10 years ago, he was arrested at the airport by state intelligence agents and detained for questioning. This time, he was also recognized. The border agents knew Bojang's name from his work as a radio journalist in West Africa. And here he is, covering the story of his life. With a drive to the Gambia River, we hop in a wooden boat to make our way to the capital, Banjul. There is no dock. The men from the boat seat us on their shoulders and carry us the few feet from the boat to Banjul's shore. Bojang hops down off the man's shoulders, first one foot and then the other, with a broad smile on his face. His phone has been buzzing with messages. “‘I shed tears for you. Tears of joy for you. I'm so happy for kiddo. And I know I love you dearly.' Emotional, huh?" Hours after former President Yahya Jammeh said he would cede power to Adama Barrow, the streets of the capital Banjul were quiet as Jammeh still had not left the country, but there was a cautious sense of relief in the air. On the streets of Banjul, we run into friends and family. “Seeing him in the country, is it Sheriff Bojang Jr? And he said yes, and I was, like, good to see him … but these first hours back are disorienting," Bojang said. Bojang still does not know why he was detained at the airport that day in April 2007. He thinks it was because he had taken part in anti-Jammeh protests in London, where he was studying. He had flown home to visit his dying father. When the security agents released him, they took his Gambian identity papers. Bojang quickly went to his hometown before heading to Dakar. It was the last time he saw his father. "So in order to live happily out of the Gambia and not be distracted by any emotion or anything, I had to turn off the part of me that was missing home, that was longing to go home, and in so doing, I succeeded but my fear, too, and my dilemma is I don't have connection, emotional attachment anymore." Bojang said. “So when I go home, my first challenge will be to rebuild that emotional attachment, to be emotionally attached to the Gambia. This is very scary for me. It is giving me sleepless nights." In exile since 2007, Sheriff Bojang Junior, far right, buys a "#Gambia Has Decided" T-shirt, hours after he returns home after former president Yahya Jammeh agreed to relinquish power to Adama Barrow, who won elections in December. 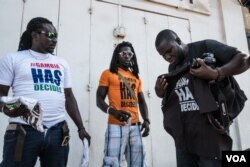 In Banjul, Bojang stops to buy a #Gambia Has Decided T-shirt. The slogan was the rallying call for supporters of the new president, Adama Barrow. In a tremendous upset, Barrow won the December elections, beating Gambia's authoritarian leader of 22 years, Yahya Jammeh. “I’m nervous, you know. It's like everything is going to end before I get there, and there is nothing for me to do," Bojang said. "I don't know. I've waited, you know when you wait and wait and wait, thinking everything will happen in front of you and then it goes wrong." Bojang waited at the border for days as Barrow was inaugurated, on schedule but at the Gambian Embassy in Dakar. Senegalese troops rolled past us, ready to enter Gambia and remove Jammeh by force. And finally, after a final-final round of negotiations, Gambians watched as Jammeh quietly boarded a plane to Guinea in the middle of the night and flew off into exile. This was the man who had threatened to behead homosexuals, claimed he had a homemade cure for HIV and was accused of ruthlessly clamping down on dissent. Activists are still demanding answers in the disappearances of at least two journalists detained by security agents and the unsolved murder of a third. Just last year, dozens of opposition members were detained. Two of their leaders were tortured to death in custody, according to TO, their political party. Bojang became a vocal critic from Dakar and he feared prison or worse if he returned to Jammeh's Gambia. On his first day back, Bojang made sure to take photos of himself around Banjul and post them on Facebook. He wanted other Gambian exiles to know it is safe to come home. Sheriff Junior at a “Welcome to The Gambia” sign in Banjul.